View from the large beach front balconies! Million $$ View from all beach front balconies! Relax, read a book or just soak in the beautiful view under the Tiki! Great beach side pool area. Pool is heated in the winter! All living rooms have sliding doors opening up to the large beach front balconies! All Kitchens at Villa Madeira are fully equipped to prepare meals for the family! Living room beach front with flat screen TV! Master bedroom with King size bed and sliding doors to the beach front balcony! Less than a mile away - John's Pass with restaurants, shopping, water sports and so much more! ***Best Deal For The Month Of May***BOOK NOW! Start your day with a walk on the beach or a few laps in the pool, relax under the tiki on a lazy island afternoon. Later, enjoy our famous sunsets from your private, screened balcony overlooking the Gulf of Mexico. Additional den offers extra space for rest and relaxation. 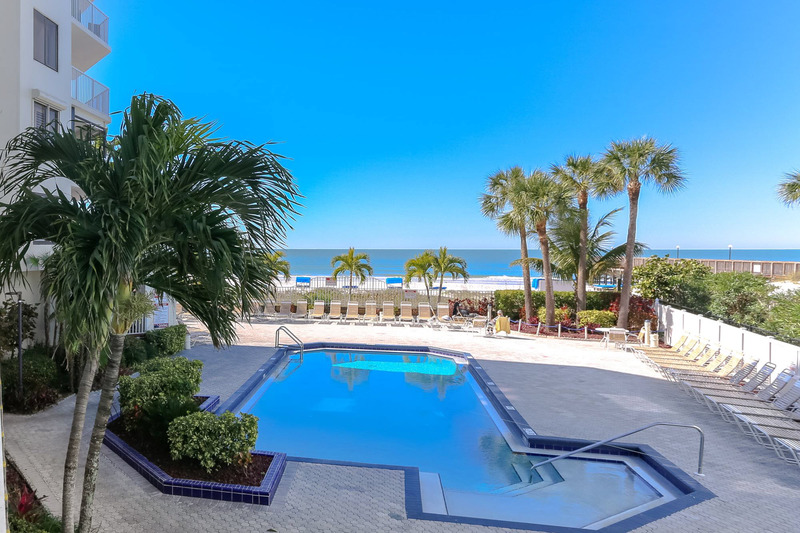 Villa Madeira offers a privileged location, on one of our area’s nicest beaches and only a mile from John’s Pass, a local attraction with restaurants, shops and water sports.